Notts County remain bottom of League Two after an excellent Newport County display saw them win 4-1 and secure a first away victory since September. 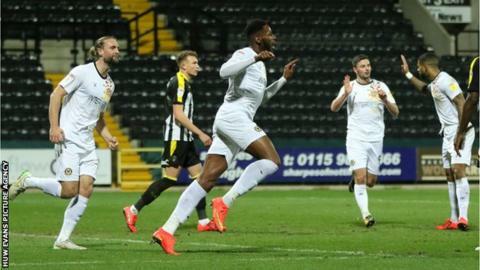 The Exiles, who held Premier League leaders Man City for 45 minutes in Saturday's 4-1 FA Cup defeat, had no issues against struggling Notts County. Fraser Franks and a Jamille Matt double put Newport 3-1 ahead at the interval despite Kane Hemmings' early equaliser. Padraig Amond's goal just after half-time gave the Exiles breathing space. Newport stay 15th but are now level on points with four sides above them on goal difference. Newport County manager Mike Flynn said: "I was more worried about tonight that I was for Saturday (against Manchester City), if I am totally honest. "I knew we had to get back to winning ways in the league, away from home and we have done that. We have gone from playing against the highest team in the country to the bottom side." Match ends, Notts County 1, Newport County 4. Second Half ends, Notts County 1, Newport County 4. Substitution, Newport County. Josh Sheehan replaces Joss Labadie because of an injury. Attempt saved. Jon Stead (Notts County) right footed shot from a difficult angle and long range on the left is saved in the top right corner. Attempt blocked. Ben Barclay (Notts County) right footed shot from outside the box is blocked. Michael Doyle (Notts County) wins a free kick on the left wing. Substitution, Newport County. Harry McKirdy replaces Jamille Matt. Attempt blocked. Craig Mackail-Smith (Notts County) left footed shot from the right side of the box is blocked. Substitution, Newport County. Matthew Dolan replaces Fraser Franks because of an injury. Attempt blocked. Jim O'Brien (Notts County) left footed shot from outside the box is blocked. Corner, Notts County. Conceded by Mickey Demetriou. Corner, Notts County. Conceded by Regan Poole. Attempt missed. Jon Stead (Notts County) right footed shot from a difficult angle on the right is just a bit too high following a set piece situation. Corner, Notts County. Conceded by Joe Day. Attempt saved. Jim O'Brien (Notts County) left footed shot from outside the box is saved in the top right corner. Attempt missed. Jim O'Brien (Notts County) left footed shot from outside the box is close, but misses to the left. Attempt missed. Enzio Boldewijn (Notts County) right footed shot from the left side of the box is close, but misses to the left. Attempt saved. Jim O'Brien (Notts County) right footed shot from outside the box is saved in the centre of the goal. Corner, Notts County. Conceded by Mark O'Brien. Attempt missed. Jon Stead (Notts County) left footed shot from the centre of the box is close, but misses to the right. Enzio Boldewijn (Notts County) wins a free kick on the right wing. Attempt missed. Padraig Amond (Newport County) right footed shot from the left side of the box is too high. Fraser Franks (Newport County) wins a free kick in the defensive half. Fraser Franks (Newport County) is shown the yellow card for a bad foul. Foul by Fraser Franks (Newport County). Substitution, Notts County. Craig Mackail-Smith replaces Virgil Gomis. Substitution, Notts County. Jon Stead replaces Lewis Alessandra. Foul by Scot Bennett (Newport County). Lewis Alessandra (Notts County) wins a free kick in the defensive half. Joss Labadie (Newport County) hits the right post with a right footed shot from outside the box.